Custom chair cushions for indoor and outdoor use can be filled with your choice of foam (indoor use) or CumuPlush™ filling (outdoor use). Deluxe custom chair cushions for indoor and outdoor use are wrapped with an additional layer, creating a crown effect, and provide you with an option of buttons. Optimal custom chair cushions for indoor and outdoor use offer the most comfort and resistance. These chair cushions are comprised of four components: foam, Memory Foam MicroGel, batting, and enclosed water-resistant ticking. Investing in chair cushions for indoor or outdoor furniture has never been easier than with Cushion Source's visualization tool and user-friendly online ordering process. With our custom chair cushions, you may choose to have a connected seat or back, or for them to be made separately. Depending on where you plan to use your custom cushions, select whether you'd like indoor or outdoor fill. We offer hundreds of high-quality indoor and outdoor fabrics, and our customers may choose their preferred detail options, such as fabric welting, decorative buttons, tie placement, and, of course, dimensions and thickness. Chair cushions are one of our more popular requests. Because we can make them custom for your style needs and wants, it is our pleasure to give you even more selection in your fabric choice. Sunbrella® fabrics are made of 100% solution-dyed yarns that can withstand fading, staining and mildewing. We have beautiful stripes, floral prints and solid fabrics to choose from. Many are designer, high-end Sunbrella fabrics that are so gorgeous, that you'll want to use them indoors. You'll be surprised how good our fabrics can match your pre-existing decor. Even though Sunbrella fabrics are ideal for your outdoor chair cushions, they are also great for the indoors. Dining room chairs, stools and other susceptible places for stains are ideal for Sunbrella. Chair cushions decorated with resilient fabrics will have your family and friends saying, "I can't believe these are outdoor fabrics!" Are you looking for just a single cushion? 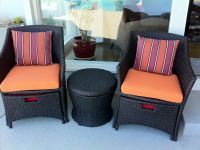 We also offer custom seat cushions and chair back cushions.